Now that the holidays are coming to a close and the new year is around the corner, it's time to plan for cleaning. And for businesses that often means junk disposal and dealing with e-waste. It may seem simple enough to throw out the old electronics in the dumpster out back. But disposing of electronic waste, or e-waste as it's called, can be a bit more problematic than that. And don't be surprised if your waste management provider refuses to take it. This is because there are a number of issues with e-waste disposal. With the ever-growing number of laws and regulations, especially in states such as California, many items such as computer monitors, TVs, and even cell phones cannot be simply tossed in the trash. What's more, when you want to properly dispose of a computer monitor - especially any old CRT devices you still have around - the process takes time, effort and money. And e-waste presents other issues, as well. Perhaps the biggest problem with e-waste is that it contains toxic materials that have been determined to be hazardous to the environment and to human health. The United States produces more e-waste annually than any other country. 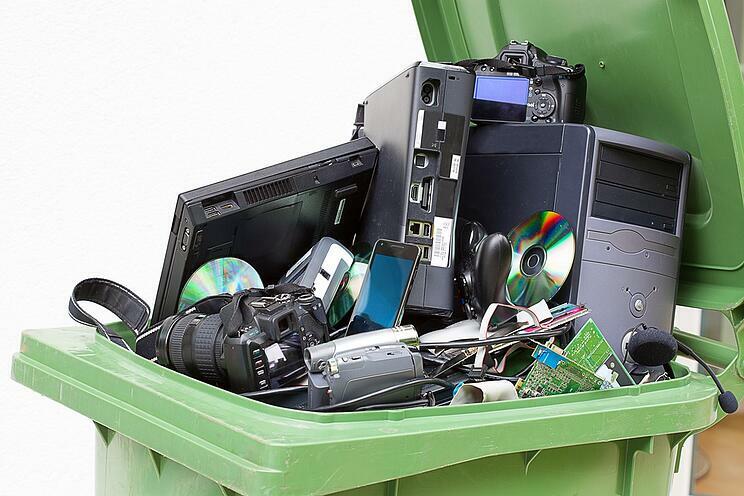 Americans throw away every year over 9.4 million tons of electronics annually. California alone produced 210,790,222 lbs of e-waste in 2012 - over 5 pounds for every California resident. But there is a practical and beneficial alternative and that is recycling. Unfortunately, we are still a long ways from being fully efficient with e-waste recycling. In fact, only 12.5% of e-waste is recycled, according to the EPA. But the potential is there for not only recycling this "junk", but for reclaiming valuable materials and resources within the e-waste materials. For every one million cell phones that are recycled, the EPA states that 35,274 lbs of copper, 772 lbs of silver, 75 lbs of gold, and 33 lbs of palladium can be recovered. For those not familiar with palladium, palladium is a precious metal using for making electrical contacts, as well as surgical instruments and parts for watches. Recycling circuit boards can be more valuable than mining for ore! One ton of circuit boards is estimated to contain 40-800 times more gold than one metric ton of ore. There is 30-40 times more copper in a ton of circuit boards that can be mined from one metric ton of ore. Recycling one million laptops saves the energy equivalent to the electricity used by 3,657 U.S. homes in a year, according to the EPA. Based on e-waste disposal rates, Americans throw out phones containing over $60 million in gold and/or silver every year. Going with Junk King provides your business with an efficient, safe and eco-friendly e-waste removal service. 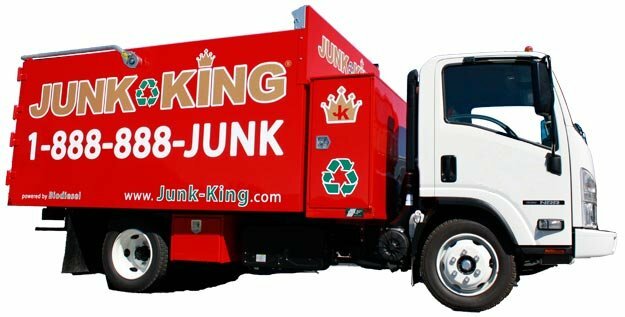 With Junk King, you don’t need to worry about the pick up or disposal of those old items. Not only that, but we make sure that your old electronics end up in the right place: whether it be a charity if the electronics are still functioning, or a recycling facility to ensure your e-waste is disposed of in an eco-friendly way. When you are ready to remove those old electronics it’s as simple as 1, 2, 3. You make an appointment by booking online above or by calling 1.888.888.JUNK (5865).